1 DAY OR SAME DAY SHIPPING ON ALL ORDERS ON WEEK DAYS!! This listing is for 1 piece of sculpture of a man 3D art home decor in Bronze colour Made of Resin. We are located in Montreal and ship worldwide. All orders to the are shipped with priority mail with a tracking number and insurance. Art home decor sculpture dimensions are approx 15H. This is an AMAZING AND UNIQUE piece of art. *Be aware of paying more by buying the same items from other seller. We are proudly painting our climbing man in Canada and shipping from Canada! * WHAT.IS.THIS.ART! This is a beautiful high end art for your home decor. Made out of solid resin material. Make your house decor stand out of the ordinary with these amazing decor. ONE Wall-mount sculpture of a man for a distinctive décor accent Crafted from Resin in BRONZE COLOUR. Comes with a double sided adhesive mounting squares for easy installation. Will look amazing hung alone or grouped. 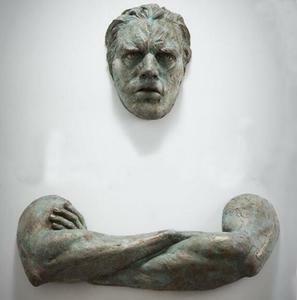 This unique wall sculpture creates the illusion of a man in 3D. This work of art is unique and and added value to any house decor. Easy to install. Change the look of your house decor with these 3D man. We offer FREE man when you buy 4 and more. You can mix and match the designs. MIX AND MATCH DESIGNS AVAILABLE. SEND MESSAGE WITH REQUIRED DESIGNS AFTER CHECKOUT. 1 DAY OR SAME DAY SHIPPING ON ALL ORDERS ON WEEK DAYS!! This listing is for 1 piece of sculpture of a man 3D art home decor in Bronze colour Made of Resin. We are located in Montreal and ship anywhere worldwide. All orders to the are shipped with priority mail with a tracking number and insurance. Art home decor sculpture dimensions are approx 15H. This is an AMAZING AND UNIQUE piece of art. *Be aware of paying more by buying the same items from other seller. We are proudly painting our climbing man in Canada and shipping from Canada! * WHAT.IS.THIS.ART! This is a beautiful high end art for your home decor. Made out of solid resin material. Make your house decor stand out of the ordinary with these amazing decor. ONE Wall-mount sculpture of a man for a distinctive décor accent Crafted from Resin in BRONZE COLOUR. Comes with a double sided adhesive mounting squares for easy installation. Will look amazing hung alone or grouped. This unique wall sculpture creates the illusion of a man in 3D. This work of art is unique and and added value to any house decor. Easy to install. Change the look of your house decor with these 3D man. We offer FREE man when you buy 4 and more. You can mix and match the designs. MIX AND MATCH DESIGNS AVAILABLE. SEND MESSAGE WITH REQUIRED DESIGNS AFTER CHECKOUT. 1 DAY OR SAME DAY SHIPPING ON ALL ORDERS ON WEEK DAYS!! This listing is for 1 set of 5 pcs of Climbing man wall art home decor in HAND PAINTED BROWN, RED, AQUA METAL, NEON YELLOW and ORANGE colours. MIX AND MATCH COLOURS AVAILABLE. SEND MESSAGE WITH REQUIRED COLOURS AFTER CHECKOUT. ALL REASONABLE OFFERS ACCEPTED!! USA seller! I am located in Maryland and ship anywhere in the USA and CANADA for FREE. Ships worldwide for a flat rate. All orders to the are shipped with priority mail with a tracking number and insurance. Climbing man wall art home decor sculpture dimensions are 6H x 3W x 3D. *Be aware of paying more by buying the same items from other seller. We are proudly painting our climbing man in the USA and shipping from the USA! * WHAT.IS.THIS.ART! This is a beautiful high end wall art for your home decor. Climbing man wall art made out of solid resin material. Make your house decor stand out of the ordinary with these amazing climbing wall man. Each climbing man size is 6H x 3W x 3H. ONE Set of 5 Wall-mount sculpture of a man climbing a leather rope for distinctive décor accent. Crafted from Resin and hand painted in 5 different colors. Comes with a twisted loop knot for easy installation. This sculpture is painted in the USA and coated with a high velocity glossy varnish. Will look amazing hung alone or grouped. This unique wall sculpture creates the illusion of a man climbing the rope or any surface he is hung on. This work of art features a knotted loop at the top to allow hanging with a with an included pin. Easy to install. Listing is for 1 set of 5 climbing man with leathered cord approx 1 and black hanging pin. Change the look of your house decor with these bright colorful Climbing man We offer FREE climbing man when you buy 4 and more. You can mix and match the colours. MIX AND MATCH COLOURS AVAILABLE. SEND MESSAGE WITH REQUIRED COLOURS AFTER CHECKOUT. Customs made colours also available. 1 DAY OR SAME DAY SHIPPING ON ALL ORDERS ON WEEK DAYS!! This listing is for 1 set of 5 pcs of Climbing man wearing a backpack wall art home decor HAND Painted in 5 different BLUE colours. MIX AND MATCH COLOURS AVAILABLE. SEND MESSAGE WITH REQUIRED COLOURS AFTER CHECKOUT. ALL REASONABLE OFFERS ACCEPTED!! USA seller! I am located in Maryland and ship anywhere in the USA and CANADA for FREE. Ships worldwide for a flat rate. All orders to the are shipped with priority mail with a tracking number and insurance. Climbing man wall art home decor sculpture dimensions are 6H x 3W x 3D. *Be aware of paying more by buying the same items from other seller. We are proudly painting our climbing man in the USA and shipping from the USA! * WHAT.IS.THIS.ART! This is a beautiful high end wall art for your home decor. Climbing man wall art made out of solid resin material. Make your house decor stand out of the ordinary with these amazing climbing wall man. Each climbing man size is 6H x 3W x 3H. ONE set of 5 Wall-mount sculpture of a man climbing a leather rope for distinctive décor accent Crafted from Resin and HAND painted in black sand colour. Comes with a twisted loop knot for easy installation. This sculpture is painted in the USA. Will look amazing hung alone or grouped. This unique wall sculpture creates the illusion of a man climbing the rope or any surface he is hung on. This work of art features a knotted loop at the top to allow hanging with a with an included pin. Easy to install. Listing is for 1 set of 5 climbing man with leather cord approx 1 and black hanging pin. 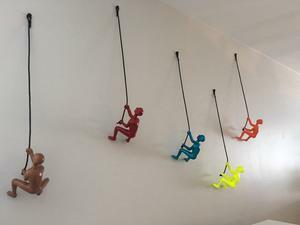 (If longer leather cord required we can provide for FREE) Change the look of your house decor with these bright colorful Climbing man We offer FREE climbing man when you buy 4 and more. You can mix and match the colours. MIX AND MATCH COLOURS AVAILABLE. SEND MESSAGE WITH REQUIRED COLOURS AFTER CHECKOUT. Customs made colours also available. 1 DAY OR SAME DAY SHIPPING ON ALL ORDERS ON WEEK DAYS!! This listing is for 1 set of 3 pcs of Plunging man wall art home decor in HAND PAINTED Choco Dark colours. MIX AND MATCH COLOURS AVAILABLE. SEND MESSAGE WITH REQUIRED COLOURS AFTER CHECKOUT. ALL REASONABLE OFFERS ACCEPTED!! We are located in Montreal and ship anywhere in world. All orders to the are shipped with priority mail with a tracking number and insurance. 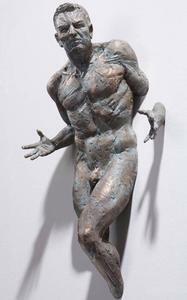 Plunging man wall art home decor sculpture dimensions are 12H x 12W. *Be aware of paying more by buying the same items from other seller. We are proudly painting our climbing man in Canada and shipping from Canada! * WHAT.IS.THIS.ART! This is a beautiful high end wall art for your home decor. Plunging man wall art made out of solid resin material. Make your house decor stand out of the ordinary with these amazing climbing wall man. Each Plunging man size is 12H x 12W. ONE Set of 3 Wall-mount sculpture of a man plunging hanged on a leather rope for distinctive décor accent. Crafted from Resin and hand painted in Choco Dark colors. Comes with a twisted loop knot for easy installation. This sculpture is painted in Canada and coated with a high velocity glossy varnish. Will look amazing hung alone or grouped. 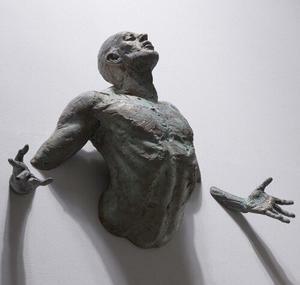 This unique wall sculpture creates the illusion of a man Plunging with the rope or any surface he is hung on. This work of art features a knotted loop at the top to allow hanging with a with an included pin. Easy to install. Listing is for 1 set of 3 Plunging man with leathered cord approx 1 and black hanging pin. Change the look of your house decor with these bright colorful Climbing man We offer FREE plunging man sets when you buy 4 sets and more. You can mix and match the colours. MIX AND MATCH COLOURS AVAILABLE. SEND MESSAGE WITH REQUIRED COLOURS AFTER CHECKOUT. Customs made colours also available. 1 DAY OR SAME DAY SHIPPING ON ALL ORDERS ON WEEK DAYS!! This listing is for 1 set of 5 pcs of Climbing man wearing a backpack wall art home decor in GOLD HAND PAINTED colour. MIX AND MATCH COLOURS AVAILABLE. SEND MESSAGE WITH REQUIRED COLOURS AFTER CHECKOUT. ALL REASONABLE OFFERS ACCEPTED!! We are located in Montreal and ship anywhere in the USA and CANADA for FREE. Ships worldwide for a flat rate. All orders to the are shipped with priority mail with a tracking number and insurance. Climbing man wall art home decor sculpture dimensions are 6H x 3W x 3D. *Be aware of paying more by buying the same items from other seller. We are proudly painting our climbing man in Canada and shipping from Canada! * WHAT.IS.THIS.ART! This is a beautiful high end wall art for your home decor. Climbing man wall art made out of solid resin material. Make your house decor stand out of the ordinary with these amazing climbing wall man. Each climbing man size is 6H x 3W x 3H. 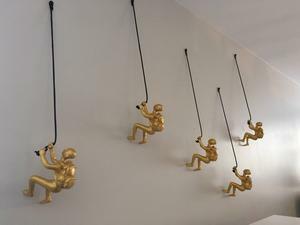 ONE set of 5 Wall-mount sculpture of a man climbing a leathered rope for distinctive décor accent Crafted from Resin in GOLD HAND PAINTED colour. Comes with a twisted loop knot for easy installation. This sculpture is painted in Canada and coated with a high velocity glossy varnish. Will look amazing hung alone or grouped. 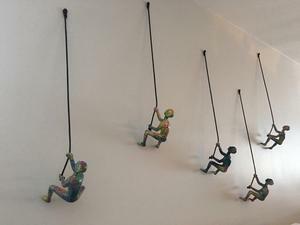 This unique wall sculpture creates the illusion of a man climbing the rope or any surface he is hung on. This work of art features a knotted loop at the top to allow hanging with a with an included pin. Easy to install. Listing is for 1 set of 5 climbing man wearing a backpack with leather cord approx 1 and black hanging pin. Change the look of your house decor with these bright colorful Climbing man We offer FREE climbing man when you buy 4 and more. You can mix and match the colours. MIX AND MATCH COLOURS AVAILABLE. SEND MESSAGE WITH REQUIRED COLOURS AFTER CHECKOUT. Customs made colours also available. 1 DAY OR SAME DAY SHIPPING ON ALL ORDERS ON WEEK DAYS!! 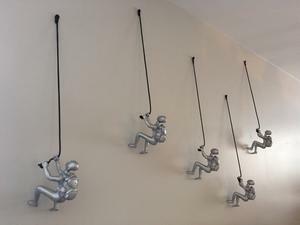 This listing is for 1 set of 5 pcs of Climbing man with a backpack wall art home decor in SILVER HAND PAINTED. MIX AND MATCH COLOURS AVAILABLE. SEND MESSAGE WITH REQUIRED COLOURS AFTER CHECKOUT. ALL REASONABLE OFFERS ACCEPTED!! We are located in Montreal and ship anywhere in the USA and CANADA for FREE. Ships worldwide for a flat rate. All orders to the are shipped with priority mail with a tracking number and insurance. Climbing man wall art home decor sculpture dimensions are 6H x 3W x 3D. *Be aware of paying more by buying the same items from other seller. We are proudly painting our climbing man in Canada and shipping from Canada! * WHAT.IS.THIS.ART! This is a beautiful high end wall art for your home decor. Climbing man wall art made out of solid resin material. Make your house decor stand out of the ordinary with these amazing climbing wall man. Each climbing man size is 6H x 3W x 3H. 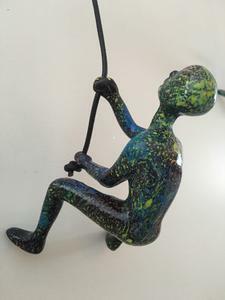 ONE Wall-mount sculpture of a man climbing wearing a backpack with a leathered rope for distinctive décor accent Crafted from Resin in SILVER HAND PAINTED. Comes with a twisted loop knot for easy installation. This sculpture is painted in Canada and coated with a high velocity glossy varnish. Will look amazing hung alone or grouped. 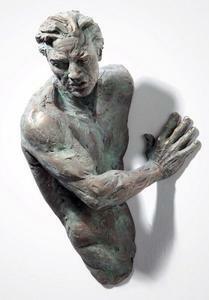 This unique wall sculpture creates the illusion of a man climbing the rope or any surface he is hung on. This work of art features a knotted loop at the top to allow hanging with a with an included pin. Easy to install. Listing is for 1 set of 5 climbing man with leathered cord approx 1 and black hanging pin. Change the look of your house decor with these bright colorful Climbing man We offer FREE climbing man sets when you buy 4 sets and more. You can mix and match the colours. MIX AND MATCH COLOURS AVAILABLE. SEND MESSAGE WITH REQUIRED COLOURS AFTER CHECKOUT. Customs made colours also available. 1 DAY OR SAME DAY SHIPPING ON ALL ORDERS ON WEEK DAYS!! This listing is for 1 piece of Climbing man wall art home decor in ORANGE colour. MIX AND MATCH COLOURS AVAILABLE. SEND MESSAGE WITH REQUIRED COLOURS AFTER CHECKOUT. ALL REASONABLE OFFERS ACCEPTED!! We are located in Montreal and ship anywhere in the USA and CANADA for FREE. Ships worldwide for a flat rate. All orders to the are shipped with priority mail with a tracking number and insurance. Climbing man wall art home decor sculpture dimensions are 6H x 3W x 3D. *Be aware of paying more by buying the same items from other seller. We are proudly painting our climbing man in Canada and shipping from Canada! * WHAT.IS.THIS.ART! This is a beautiful high end wall art for your home decor. Climbing man wall art made out of solid resin material. Make your house decor stand out of the ordinary with these amazing climbing wall man. Each climbing man size is 6H x 3W x 3H. 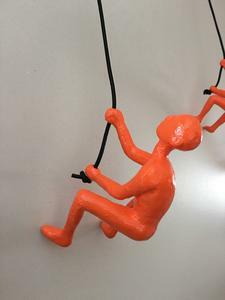 ONE sculpture of a man climbing a leathered rope for distinctive décor accent Crafted from Resin in ORANGE colour. Comes with a twisted loop knot for easy installation. 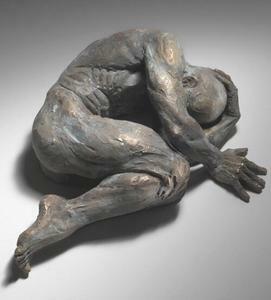 This sculpture is painted in Canada and coated with a high velocity glossy varnish. Will look amazing hung alone or grouped. This unique wall sculpture creates the illusion of a man climbing the rope or any surface he is hung on. This work of art features a knotted loop at the top to allow hanging with a with an included pin. Easy to install. Listing is for 1 climbing man with leather cord approx 1 and black hanging pin. Change the look of your house decor with these bright colorful Climbing man We offer FREE climbing man when you buy 4 and more. You can mix and match the colours. MIX AND MATCH COLOURS AVAILABLE. SEND MESSAGE WITH REQUIRED COLOURS AFTER CHECKOUT. Customs made colours also available. 1 DAY OR SAME DAY SHIPPING ON ALL ORDERS ON WEEK DAYS!! This listing is for 1 set of 6 pcs of Climbing man wall art home decor in BRONZE ANTIQUE colour each climbing man is in a different position (3 man and 3 ladies). MIX AND MATCH COLOURS AVAILABLE. SEND MESSAGE WITH REQUIRED COLOURS AFTER CHECKOUT. ALL REASONABLE OFFERS ACCEPTED!! We are located in Montreal and ship anywhere in the USA and CANADA for FREE. Ships worldwide for a flat rate. All orders to the are shipped with priority mail with a tracking number and insurance. Climbing man wall art home decor sculpture dimensions are 6H x 3W x 3D. *Be aware of paying more by buying the same items from other seller. We are proudly painting our climbing man in the Canada and shipping from Canada! * WHAT.IS.THIS.ART! This is a beautiful high end wall art for your home decor. Climbing man wall art made out of solid resin material. Make your house decor stand out of the ordinary with these amazing climbing wall man. Each climbing man size is 6H x 3W x 3H. 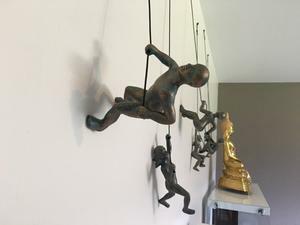 ONE set of 6 Wall-mount sculpture of a man climbing a leathered rope for distinctive décor accent Crafted from Resin in BRONZE ANTIQUE colour. Comes with a twisted loop knot for easy installation. This sculpture is painted in the Canada and coated with a high velocity glossy varnish. Will look amazing hung alone or grouped. This unique wall sculpture creates the illusion of a man climbing the rope or any surface he is hung on. This work of art features a knotted loop at the top to allow hanging with a with an included pin. Easy to install. 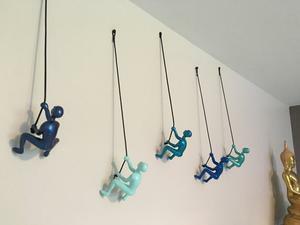 Listing is for 1 set of 6 climbing man with leathered cord approx 1 and black hanging pin. Change the look of your house decor with these bright colorful Climbing man We offer FREE climbing man set when you buy 4 sets of 6 or more. You can mix and match the colours. MIX AND MATCH COLOURS AVAILABLE. SEND MESSAGE WITH REQUIRED COLOURS AFTER CHECKOUT. Customs made colours also available. 1 DAY OR SAME DAY SHIPPING ON ALL ORDERS ON WEEK DAYS!! This listing is for 1 Climbing man wall art home decor in PEARL PINK colour. BUY 4 at listing price get 1 FREE BUY 5 at listing price get 2 FREE BUY 6 at listing price get 3 FREE MIX AND MATCH COLOURS AVAILABLE. SEND MESSAGE WITH REQUIRED COLOURS AFTER CHECKOUT. ALL REASONABLE OFFERS ACCEPTED!! We are located in Montreal and ship anywhere in the USA and CANADA for FREE. Ships worldwide for a flat rate. All orders to the are shipped with priority mail with a tracking number and insurance. Climbing man wall art home decor sculpture dimensions are 6H x 3W x 3D. *Be aware of paying more by buying the same items from other seller. We are proudly painting our climbing man in Canada and shipping from Canada! * WHAT.IS.THIS.ART! This is a beautiful high end wall art for your home decor. Climbing man wall art made out of solid resin material. Make your house decor stand out of the ordinary with these amazing climbing wall man. Each climbing man size is 6H x 3W x 3H. ONE Wall-mount sculpture of a man climbing a leathered rope for distinctive décor accent Crafted from Resin in PEARL PINK colour. Comes with a twisted loop knot for easy installation. This sculpture is painted in Canada and coated with a high velocity glossy varnish. Will look amazing hung alone or grouped. This unique wall sculpture creates the illusion of a man climbing the rope or any surface he is hung on. This work of art features a knotted loop at the top to allow hanging with a with an included pin. Easy to install. Listing is for 1 climbing man with leathered cord approx 1 and black hanging pin. Change the look of your house decor with these bright colorful Climbing man We offer FREE climbing man when you buy 4 and more. You can mix and match the colours. MIX AND MATCH COLOURS AVAILABLE. SEND MESSAGE WITH REQUIRED COLOURS AFTER CHECKOUT. Customs made colours also available. 1 DAY OR SAME DAY SHIPPING ON ALL ORDERS ON WEEK DAYS!! This listing is for 1 Climbing man wall art home decor in MULTI-COLOR DARK colour. BUY 4 at listing price get 1 FREE BUY 5 at listing price get 2 FREE BUY 6 at listing price get 3 FREE MIX AND MATCH COLOURS AVAILABLE. SEND MESSAGE WITH REQUIRED COLOURS AFTER CHECKOUT. ALL REASONABLE OFFERS ACCEPTED!! We are located in Montreal and ship anywhere in the USA and CANADA for FREE. Ships worldwide for a flat rate. All orders to the are shipped with priority mail with a tracking number and insurance. Climbing man wall art home decor sculpture dimensions are 6H x 3W x 3D. *Be aware of paying more by buying the same items from other seller. We are proudly painting our climbing man in Canada and shipping from Canada! * WHAT.IS.THIS.ART! This is a beautiful high end wall art for your home decor. Climbing man wall art made out of solid resin material. Make your house decor stand out of the ordinary with these amazing climbing wall man. Each climbing man size is 6H x 3W x 3H. ONE Wall-mount sculpture of a man climbing a leathered rope for distinctive décor accent Crafted from Resin in MULTI-COLOR DARK colour. Comes with a twisted loop knot for easy installation. This sculpture is painted in Canada and coated with a high velocity glossy varnish. Will look amazing hung alone or grouped. This unique wall sculpture creates the illusion of a man climbing the rope or any surface he is hung on. This work of art features a knotted loop at the top to allow hanging with a with an included pin. Easy to install. Listing is for 1 climbing man with leathered cord approx 1 and black hanging pin. Change the look of your house decor with these bright colorful Climbing man We offer FREE climbing man when you buy 4 and more. You can mix and match the colours. MIX AND MATCH COLOURS AVAILABLE. SEND MESSAGE WITH REQUIRED COLOURS AFTER CHECKOUT. Customs made colours also available. 1 DAY OR SAME DAY SHIPPING ON ALL ORDERS ON WEEK DAYS!! 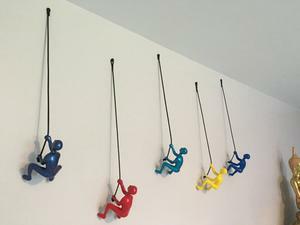 This listing is for 1 set of 5 pcs of Climbing man wall art home decor in HAND PAINTED METAL BLUE, RED, AQUA METAL, YELLOW and SKY BLUE colours. MIX AND MATCH COLOURS AVAILABLE. SEND MESSAGE WITH REQUIRED COLOURS AFTER CHECKOUT. ALL REASONABLE OFFERS ACCEPTED!! We are located in Montreal and ship anywhere in the USA and CANADA for FREE. Ships worldwide for a flat rate. All orders to the are shipped with priority mail with a tracking number and insurance. Climbing man wall art home decor sculpture dimensions are 6H x 3W x 3D. *Be aware of paying more by buying the same items from other seller. We are proudly painting our climbing man in the Canada and shipping from Canada! * WHAT.IS.THIS.ART! This is a beautiful high end wall art for your home decor. Climbing man wall art made out of solid resin material. Make your house decor stand out of the ordinary with these amazing climbing wall man. Each climbing man size is 6H x 3W x 3H. ONE Set of 5 Wall-mount sculpture of a man climbing a leather rope for distinctive décor accent. Crafted from Resin and hand painted in 5 different colors. Comes with a twisted loop knot for easy installation. This sculpture is painted in Canada and coated with a high velocity glossy varnish. Will look amazing hung alone or grouped. This unique wall sculpture creates the illusion of a man climbing the rope or any surface he is hung on. This work of art features a knotted loop at the top to allow hanging with a with an included pin. Easy to install. Listing is for 1 set of 5 climbing man with leathered cord approx 1 and black hanging pin. Change the look of your house decor with these bright colorful Climbing man We offer FREE climbing man when you buy 4 and more. You can mix and match the colours. MIX AND MATCH COLOURS AVAILABLE. SEND MESSAGE WITH REQUIRED COLOURS AFTER CHECKOUT. Customs made colours also available. 1 DAY OR SAME DAY SHIPPING ON ALL ORDERS ON WEEK DAYS!! This listing is for 1 set of 5 pcs of Climbing man wall art home decor in MULTI-COLOR FLUO colour. MIX AND MATCH COLOURS AVAILABLE. SEND MESSAGE WITH REQUIRED COLOURS AFTER CHECKOUT. ALL REASONABLE OFFERS ACCEPTED!! We are located in Montreal and ship anywhere in the USA and CANADA for FREE. Ships worldwide for a flat rate. All orders to the are shipped with priority mail with a tracking number and insurance. Climbing man wall art home decor sculpture dimensions are 6H x 3W x 3D. *Be aware of paying more by buying the same items from other seller. We are proudly painting our climbing man in Canada and shipping from Canada! * WHAT.IS.THIS.ART! This is a beautiful high end wall art for your home decor. Climbing man wall art made out of solid resin material. Make your house decor stand out of the ordinary with these amazing climbing wall man. Each climbing man size is 6H x 3W x 3H. ONE set of 5 Wall-mount sculpture of a man climbing a leathered rope for distinctive décor accent Crafted from Resin in MULTI-COLOR FLUO colour. Comes with a twisted loop knot for easy installation. This sculpture is painted in Canada and coated with a high velocity glossy varnish. Will look amazing hung alone or grouped. 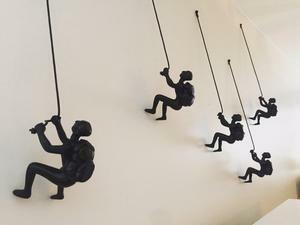 This unique wall sculpture creates the illusion of a man climbing the rope or any surface he is hung on. This work of art features a knotted loop at the top to allow hanging with a with an included pin. Easy to install. Listing is for 1 set of 5 climbing man with leathered cord approx 1 and black hanging pin. Change the look of your house decor with these bright colorful Climbing man We offer FREE climbing man when you buy 4 and more. You can mix and match the colours. MIX AND MATCH COLOURS AVAILABLE. SEND MESSAGE WITH REQUIRED COLOURS AFTER CHECKOUT. Customs made colours also available. 1 DAY OR SAME DAY SHIPPING ON ALL ORDERS ON WEEK DAYS!! This listing is for 1 piece of sculpture of a man 3D art home decor in Bronze colour Made of Resin. CHOSE YOUR DESIGN. We are located in Montreal and ship worldwide. All orders to the are shipped with priority mail with a tracking number and insurance. Art home decor sculpture dimensions are approx 15H. This is an AMAZING AND UNIQUE piece of art. *Be aware of paying more by buying the same items from other seller. We are proudly painting our climbing man in Canada and shipping from Canada! * WHAT.IS.THIS.ART! This is a beautiful high end art for your home decor. Made out of solid resin material. Make your house decor stand out of the ordinary with these amazing decor. ONE Wall-mount sculpture of a man for a distinctive décor accent Crafted from Resin in BRONZE COLOUR. Comes with a double sided adhesive mounting squares for easy installation. Will look amazing hung alone or grouped. This unique wall sculpture creates the illusion of a man in 3D. This work of art is unique and and added value to any house decor. Easy to install. Change the look of your house decor with these 3D man. We offer FREE man when you buy 4 and more. You can mix and match the designs. MIX AND MATCH DESIGNS AVAILABLE. SEND MESSAGE WITH REQUIRED DESIGNS AFTER CHECKOUT. 1 DAY OR SAME DAY SHIPPING ON ALL ORDERS ON WEEK DAYS!! This listing is for 1 pcs of Climbing man wall art home decor in Choco dark color. BUY 4 at listing price get 1 FREE BUY 5 at listing price get 2 FREE BUY 6 at listing price get 3 FREE MIX AND MATCH COLOURS AVAILABLE. SEND MESSAGE WITH REQUIRED COLOURS AFTER CHECKOUT. ALL REASONABLE OFFERS ACCEPTED!! We are located in Montreal and ship anywhere in the USA and CANADA for FREE. Ships worldwide for a flat rate. All orders to the are shipped with priority mail with a tracking number and insurance. Climbing man wall art home decor sculpture dimensions are 6H x 3W x 3D. *Be aware of paying more by buying the same items from other seller. We are proudly painting our climbing man in Canada and shipping from Canada! * WHAT.IS.THIS.ART! This is a beautiful high end wall art for your home decor. Climbing man wall art made out of solid resin material. Make your house decor stand out of the ordinary with these amazing climbing wall man. Each climbing man size is 6H x 3W x 3H. ONE Wall-mount sculpture of a man climbing a leathered rope for distinctive décor accent Crafted from Resin in Choco dark color Comes with a twisted loop knot for easy installation. This sculpture is spray painted in Canada and coated with a high velocity glossy varnish. Will look amazing hung alone or grouped. This unique wall sculpture creates the illusion of a man climbing the rope or any surface he is hung on. This work of art features a knotted loop at the top to allow hanging with a with an included pin. Easy to install. Listing is for 1 climbing man with leather cord approx 1 and black hanging pin. Change the look of your house decor with these bright colorful Climbing man We offer FREE climbing man when you buy 4 and more. You can mix and match the colours. MIX AND MATCH COLOURS AVAILABLE. SEND MESSAGE WITH REQUIRED COLOURS AFTER CHECKOUT. Customs made colours also available. 1 DAY OR SAME DAY SHIPPING ON ALL ORDERS ON WEEK DAYS!! This listing is for 1 Climbing man wall art home decor in MULTI-COLOR FLUO colour. BUY 4 at listing price get 1 FREE BUY 5 at listing price get 2 FREE BUY 6 at listing price get 3 FREE MIX AND MATCH COLOURS AVAILABLE. SEND MESSAGE WITH REQUIRED COLOURS AFTER CHECKOUT. ALL REASONABLE OFFERS ACCEPTED!! We are located in Montreal and ship anywhere in the USA and CANADA for FREE. Ships worldwide for a flat rate. All orders to the are shipped with priority mail with a tracking number and insurance. Climbing man wall art home decor sculpture dimensions are 6H x 3W x 3D. *Be aware of paying more by buying the same items from other seller. We are proudly painting our climbing man in Canada and shipping from Canada! * WHAT.IS.THIS.ART! This is a beautiful high end wall art for your home decor. Climbing man wall art made out of solid resin material. Make your house decor stand out of the ordinary with these amazing climbing wall man. Each climbing man size is 6H x 3W x 3H. 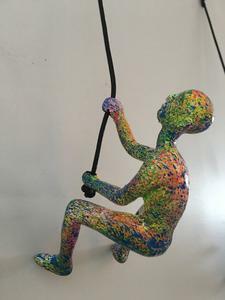 ONE Wall-mount sculpture of a man climbing a leathered rope for distinctive décor accent Crafted from Resin in MULTI-COLOR FLUO colour. Comes with a twisted loop knot for easy installation. This sculpture is painted in Canada and coated with a high velocity glossy varnish. Will look amazing hung alone or grouped. This unique wall sculpture creates the illusion of a man climbing the rope or any surface he is hung on. This work of art features a knotted loop at the top to allow hanging with a with an included pin. Easy to install. Listing is for 1 climbing man with leathered cord approx 1 and black hanging pin. Change the look of your house decor with these bright colorful Climbing man We offer FREE climbing man when you buy 4 and more. You can mix and match the colours. MIX AND MATCH COLOURS AVAILABLE. SEND MESSAGE WITH REQUIRED COLOURS AFTER CHECKOUT. Customs made colours also available. This is a beautiful high end wall art for your home decor. The climbing man wall art made out of solid resin material makes your house decor stand out of the ordinary. 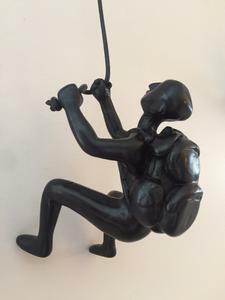 Each climbing man size is 6"H x 3"W x 3"H.
ONE set of 5 Wall-mount sculpture of a man climbing with a backpack, climbing a leather rope for distinctive décor accent. Crafted from Resin in CHOCO DARK color. Comes with a twisted loop knot for easy installation. This sculpture is painted in Canada and coated with a high velocity glossy varnish. Will look amazing hung alone or grouped. 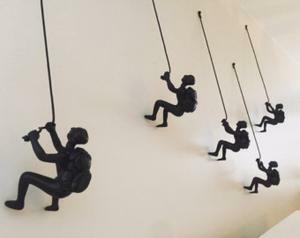 This unique wall sculpture creates the illusion of a man climbing the rope or any surface he is hung on. This work of art features a knotted loop at the top to allow hanging with an included pin. The listing is for 1 set of 5 climbing man with leathered cord approx 1' and black hanging pin. We offer FREE climbing man when you buy 4 and more. You can mix and match the colors. SEND MESSAGE WITH REQUIRED COLORS AFTER CHECKOUT. 1 DAY OR SAME DAY SHIPPING ON ALL ORDERS ON WEEK DAYS! We are located in Montreal and ship anywhere in the USA and CANADA for FREE.